First we had a documentary about corruption in cricket. Then we had an apocalyptic teen romance. And now, for our third event, we have one of the most original, and well reviewed, British films from the past few years. It’s called LOCKE and it stars Tom Hardy in one of his most powerful performances to date. He’s the only actor we see and the whole film is filmed in a single location, making it hugely innovative & interesting. The film got amazing reviews:“ingeniously executed” VARIETY“totally unique, you must see this movie” BBC RADIO 5 “one of the most nail biting thrillers of the year” TELEGRAPH“a masterclass” TIME OUT. As you know the films we screen all have one thing in common: a connection to Dartmouth Park. 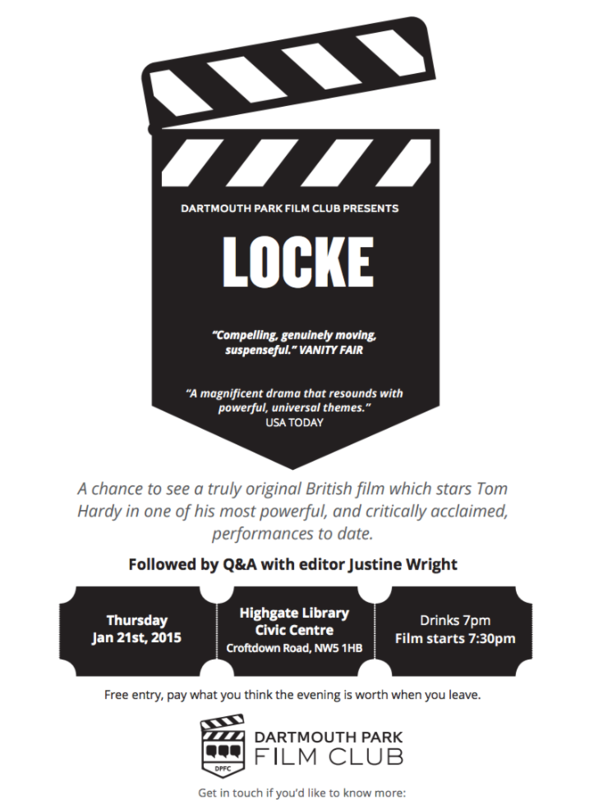 And LOCKE was edited by a super talented editor living locally, Justine Wright. Justine has edited loads of brilliant films including THE LAST KING OF SCOTLAND, THE IRON LADY, TOUCHING THE VOID and STATE OF PLAY. Now for a bit of a crazy request….anyone on this list who enjoys driving and would like to do a good deed? If you were at the last event you’ll remember I spoke about a 1959 film we’re keen to screen: SAPPHIRE. It’s a brilliant BAFTA-winning film and it’s all shot in and around Dartmouth Park so it’s absolutely perfect for our club. We’ve tracked down one of the main actors from the film, Earl Cameron, who is still alive but we’ve hit a snag in our planning. Earl is 98 years old and while he’s willing to come and speak after the film, he lives in Warwickshire and he can only come if someone can pick him up & drive him back to London the next day. We can cover all petrol costs and we’ll put him up for the night but none of us can drive there and back. Would anyone be willing to do this? It’s about a two hour drive from London and we’re looking to do the event in mid Feb.
Hope you have a wonderful Christmas and we’ll see you on Jan 21st.